This problem oriented book provides practical explanations of how to interpret engineering drawings/technical drawings using the latest ANSI standards. Cecil H. Jensen took an early retirement from teaching to devote his full time to technical writing. He held the position of Technical Director at the McLaughlin Collegiate and Vocational Institute, Oshawa, Ontario, Canada, and has more than twenty-seven years of teaching experience in mechanical drafting. He was an active member of the Canadian Standards Association (CSA) Committee on Technical Drawings. Mr. Jensen has represented Canada at international (ISO) conferences on engineering drawing standards, which took place in Oslo, Norway and Paris, France. He also represented Canada on the ANSI Y14.5M Committee on Dimensioning and Tolerancing. He is the successful author of numerous texts including Engineering Drawing and Design, Fundamentals of Engineering Drawing, Geometric Dimensioning and Tolerancing for Engineering and Manufacturing Technology, Computer-Aided Engineering Drawing, and Home Planning and Design. Before he began teaching, Mr. Jensen spent several years in industrial design. He also supervised the evening courses in Oshawa and was responsible for teaching selected courses for General Motors Corporation apprentices. 2. 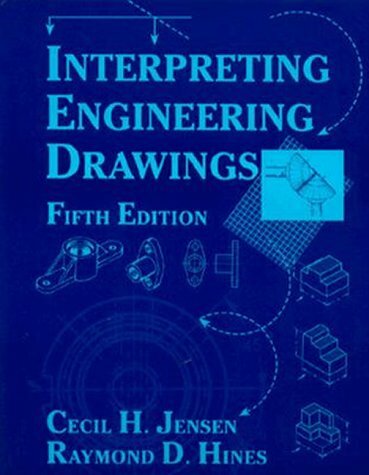 Interpreting Engineering Drawings Jensen, Cecil H.